Sunshine, it's a beautiful thing! It warms you, feeds you much needed Vitamin D and brightens your day! 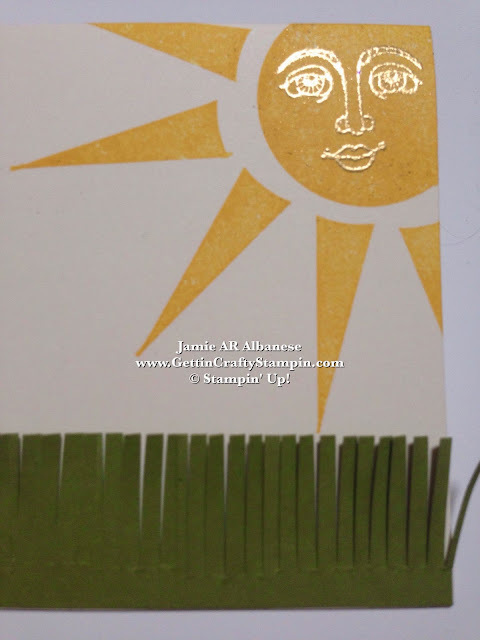 I love that this cool new Ray of Sunshine stamp set delivers a classic, beautiful sun image with a vintage face that would fit with fine art. 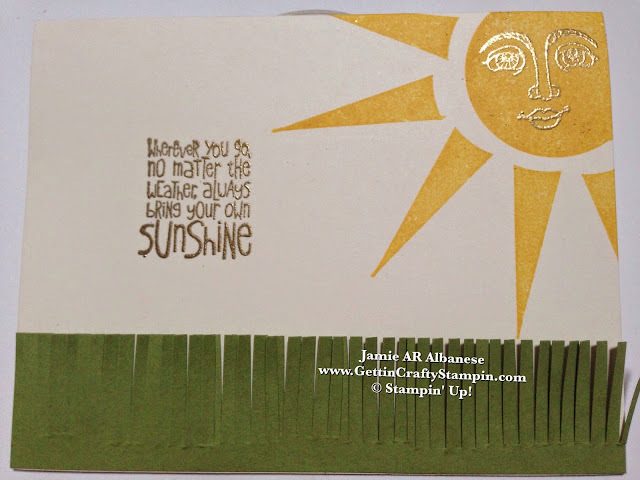 Create a quick, easy and pretty hand-stamped card that will deliver sunshine to all who receive it. 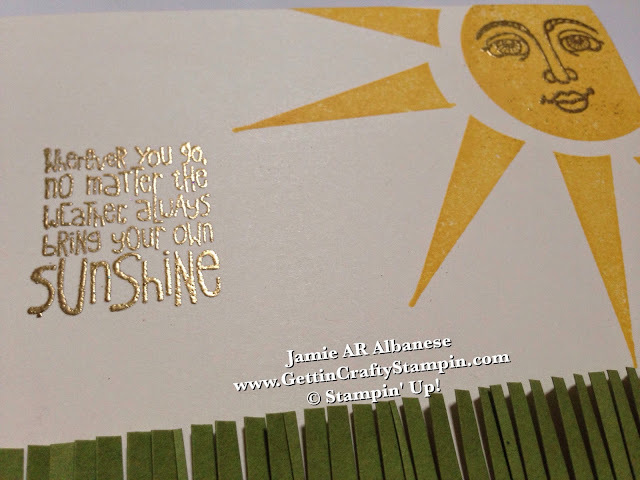 Stamp this pretty sun using the Stamp-A-Majig and Daffodil Delight ink. Rub the surface of the card, after stamped, with the Embossing Buddy. This will prepare the surface for embossing! Once the surface is prepped, stamp the face and sentiment with Versa Mark ink. Cover with the Gold Embossing Powder (which will stick to the Versa Mark ink). Shake off the excess and then heat set/melt into a rich, elegant gold metal accent using the Heat Tool. This is one of my favorite techniques and my kids call it 'magic'. Such a Pretty card... but it's a little plain. Adding the strip of the Old Olive card stock is easy to do. Take it up a notch and mimic the grass (that I so love to walk through) using the Fringe Scissors. This is a wonderful whimsical accent to this hand-crafted card. During these last few days of Summer to the cold, darker days of Winter... send a card filled with Sunshine that is sure to brighten your day. With a cool rubber stamp set that will deliver some sunshine and warm wishes, it's amazing how easy it is to brighten someone's day. Create and Celebrate life, those in and around yours with a hand-stamped card!